While the colder temperatures leave us longing for warm and sunny days, now is the perfect chance to get creative in the kitchen. 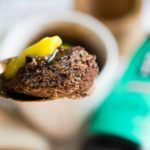 This keto collagen mug cake recipe is not only packed with amazing nutrients but takes less than 2 minutes to make. One of the best ingredients to cook with is full fat coconut milk. Full fat coconut milk is preferred over ‘light’ coconut milks because it contains all of it’s natural fatty acids. Lighter coconut milks are strained, being stripped of some of the nutrients from the healthy fats. Additionally, it’s an ideal milk for those looking for a milk free from dairy, soy or nuts. Coconut milk allows you to use an amazing source of fats (coconuts) for cooking and baking some amazing treats. The keto-friendly components of coconut milk don’t stop at it’s high fat content — it also provides us with amazing health benefits, like helping to lower blood pressure and cholesterol due to it’s abundance of lauric acid (a protective fatty acid). Lauric acid has antimicrobial properties, which make it a powerful fighter against viruses and bacterial infections. Additionally, coconut milk also helps to build muscle and strength while reducing fatigue. The MCT’s (medium-chain triglycerides) in coconut milk are perfect for recovering from hard workouts due to their high electrolyte content of magnesium and potassium. Ghee is another ingredient made optional to add to this tasty treat. Ghee recently surfaced as a highly nutritious food by the media, although it’s been used for thousands of years. By now, we all know it’s an amazing superfood, but what exactly is it? Ghee is clarified butter. It’s cooked for a longer amount of time, removing the water component and milk fat. Ghee is often preferred to use when cooking instead of butter due to its higher smoke point of 450 degrees [*]. Also, ghee is suitable for many people who suffer from lactose intolerance because the cooking process results in only a minuscule amount of lactose left in the final product. Like ghee, Perfect Keto Collagen can be added into almost anything. It’s versatility isn’t the only benefit though — it also provides MCT Oil powder to give you additional boost of nutrients. In a large mug, whisk together the eggs, coconut milk and nut butter until well combined. Add in the baking powder, salt and cacao powder. Mix to combine. Add in Perfect Keto Collagen and mix with a fork until smooth. Microwave on high heat for 2 minutes. Use a kitchen towel to remove the mug from the microwave. Let it cool off for a bit. It will be HOT! Top with a teaspoon of ghee and dig in! I would love to try this, but I have a different collagen, with no scoop. What is the weight in one scoop, so I know how much to use. Also, it’s plain collagen, so how much extra cacao should I use. Thanks. Hi Carolyn, one scoop of perfect keto collagen is about 17 grams. I would suggest about 1/2 to 1 tbsp. of unsweetened cacao. The texture of the cake was good but calls for way too much salt for this size serving. I’d definitely cut it in half next time.